State Rep. Eileen Horn being sworn into office last year. She says being able to use campaign funds for occasional child care will make it easier for parents like her to run for, and hold, public office. Commission member Jerome Hellmer said the change could help level the playing field and make it easier for parents to run for office. It’s a situation Democratic state Rep. Eileen Horn has dealt with. Running and holding office includes many of the challenges working parents face. Horn said serving as a lawmaker also requires working early mornings and late evenings. Horn and her husband have two boys, a baby and a 3-year-old. She said the long hours are already a barrier for some people to run for and serve in public office. The cost of child care can be another barrier, considering the salary lawmakers make. Legislators in Kansas make $88 per day of the session, plus another $144 per day to cover expenses. They also have a retirement package. In a normal 90-day session, the salary and expenses allowance would total just under $21,000. Horn welcomed the ethics commission decision and said she may look into using campaign funds for child care in the future. 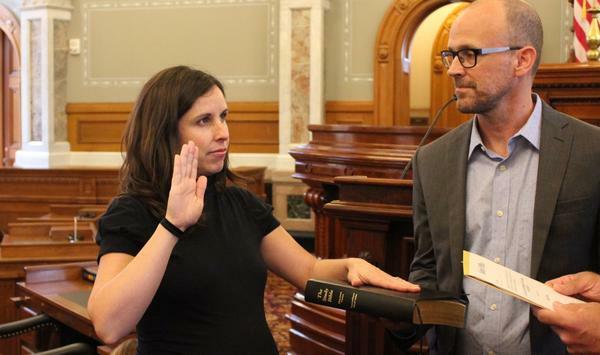 Horn replaced another lawmaker, John Wilson, who has two children and stepped down last year because he said his time was being divided between the Legislature, his career and his family. Ethics Commission Executive Director Mark Skoglund said staff drafted the change after receiving multiple inquiries about the issue, including from women running or holding office. The Federal Election Commission issued a similar decision earlier this year. “We utilized that as our guide in writing the opinion,” Skoglund said. Skoglund said Wednesday’s decision is narrow and doesn’t open the door to other uses of campaign funding. Corrected: This story originally listed the wrong vote total for the ethics commission.